0 Comments Published by Cedric Benetti on Thursday, August 23, 2007 at 8/23/2007 07:14:00 PM. 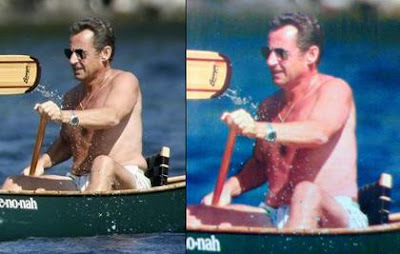 The french magazine Paris Match apparently published a photoshopped picture of president Sarkozy on vacation in New Hampshire earlier this month. The picture, taken by Reuters News Agency, was modified to appear in Match*s edition of 9th August. Another magazine, L*Express, published the original and the photoshopped version of said picture. One can clearly see that someone took away the ugly fat squirting out of the presidential short! Not since the good old days of comrade Stalin has retouching pictures been so popular.